Are you tired of dealing with weeds in your lawn? There is a time tested way to reduce and eliminate them, but it does take some work! For inexpensive weed management in a nutshell keep your lawn really healthy. Apply fertilizer at the appropriate times. Thicken with grass seed at least once per year. Make sure it has sufficient water. Spot spray with weed killer as needed. Finally pick the larger weeds by using a tool that will remove the weed and the root as well. Some weeds can be easily pulled out root and all just by grabbing them around the stalk and pulling. Others like dandelions have to be cut off several inches below the ground and then pulled out. The writer uses a small chisel to cut the root about 2 inches below ground level and then pull the plant and root out. They come out quite easily this way and will not grow back. Dandelions are the easiest to deal with. They are large, easily seen and are easy to pull out using the method mentioned. A healthy lawn mentioned in this way will deter the weeds and make your job much easier to control weeds growing in your lawn. The grass will be thick and will have a fighting chance against all of the weeds that begin growing all of the time. The above steps are relatively easy to do and do not cost a great deal of money. It can get very expensive if you allow the weeds to overtake your the grass in your lawn. Once this happens there is not many alternatives. You can kill all of the weed by spraying, but then often your left with very thin grass or less. You have to be careful when you spray to avoid damaging other plants as well as people walking on a newly sprayed lawn. One of our neighbors let his lawn go. Never watered it and never did anything about the weeds. Once this happened, all he could do is replace the lawn. He still has not replace his lawn. It is simply too expensive for home. He took another approach. He added grass seed all over the yard and then topped it off with top soil. Just enough to cover the seedlings and allow them to begin growing. A much less expensive approach, but one that takes much longer for the lawn to recover. He could also remove what was left of the sod and all of the weeds. Then he spread several truck loads of top soil on the lawn and fertilized it. The next step involved applying new sod all over his yard and watering it for many days to avoid the hot sun killing the new grass before it had a chance to establish itself. We are confident that it cost him well over a thousand dollars for his new lawn. Spending a few dollars and a few hours a week could have saved him a great deal of money. That’s the main message of this post. Saving money by doing some of your own work and maintaining your property, in this case the lawn. 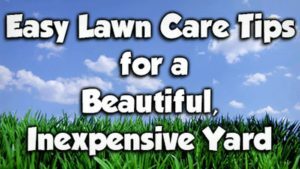 But many people are less concerned about the savings they might achieve vs. the instant repair that laying new sod will provide. For more saving money ideas, click here. Consumers can put a little work into their homes and yards and save thousands of dollars.